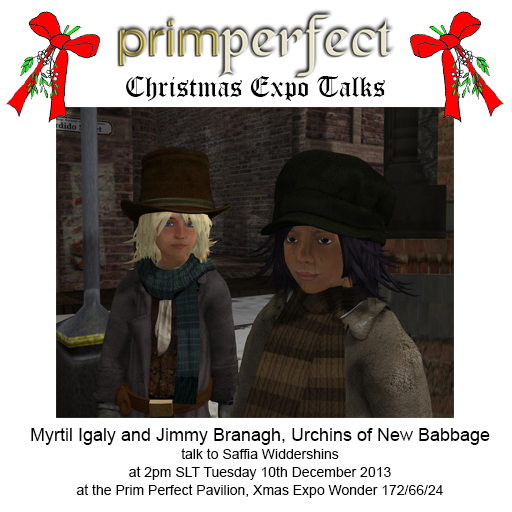 Join us today at 12 noon for the Prim Perfect Talk with Debs Regent of London inSL, and at 2pm with Myrtil Igaly and Jimmy Branagh of New Babbage in the beautiful Prim Perfect Pavilion, designed by Eliza Wierwight of Patron, on Christmas Expo Wonder. 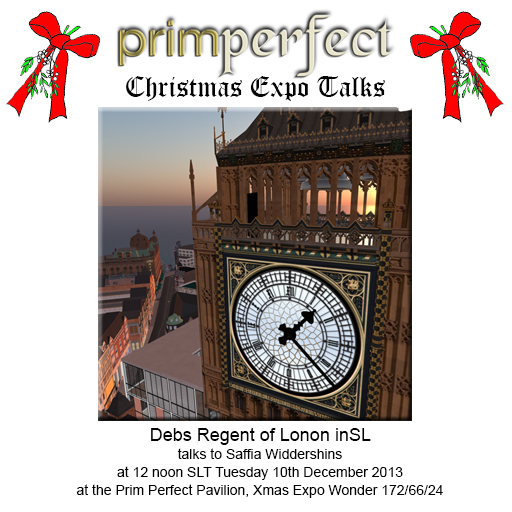 At 12 noon pm, Saffia will be talking to Debs Regent who set up the first virtual London in Second Life, and who will talk about how real can the virtual be. At 2pm she will be talking to Myrtil Igaly and Jimmy Branagh, two of the leading Urchins of New Babbage, about their lives as orphan waifs on the streets of the smokiest of steampunk cities.